I must say that I’m very sad to see 2012 go (but still excited for 2013 at the same time). It was a thrilling year with many great happenings. There were also trying times when it seemed like this place we celebrate as home is aching. The winter is just the season to allow for rest, regeneration, slow days, and cold cuddle-up-with-someone nights. More to come on recapping 2012 and looking forward to 2013. 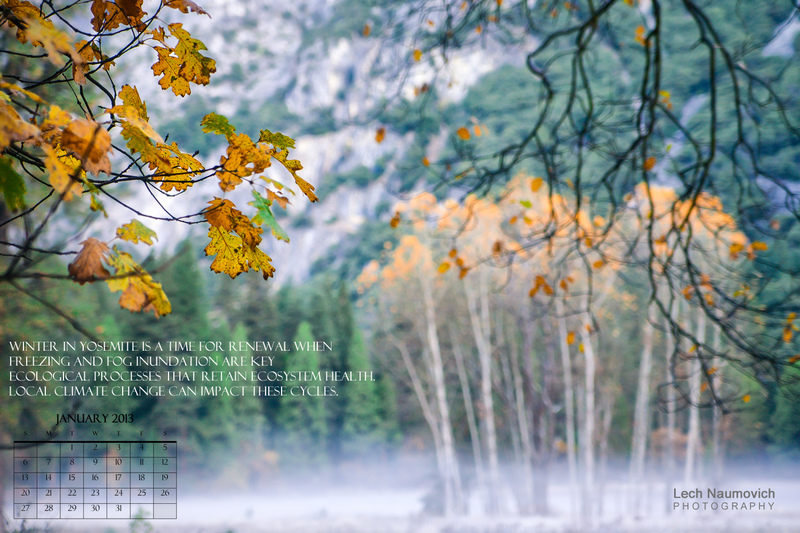 Here’s my desktop calendar January – free for all who want to use it as such. I wanted to celebrate the cold, quiet, slow times and know that they are as important as peak growing season. Here’s a photo from Yosemite valley celebrating just that. Click on the photo, then right click and save the image, or see the link below. Here’s the download to the full size picture for your desktop – Please enjoy! Thanks Lech! I’m using it! It’s gorgeous!